This selection specifies your default settings for the Control program. You are able to specify your settings by selecting from a list of checkboxes, selection boxes, and spin boxes. Some of the above settings were moved from System Setup to Production Setup in later releases of Control. Default transaction type for quick products: . This option allows you to set a default transaction type for quick products. Display quick products selection by default. If this option is selected, the quick products will appear by default. If this option is not selected, all products will appear. Track changes to line item stations as activities. If this option is selected, all changes to line item stations will be tracked by activities. If this option is not selected, no activities will be created to track changes. Default Company entry screen appears first. If this option is selected, the company entry screen will appear first. If this option is not selected, another screen will appear first. Allow UDFs to be used in Product Layouts. If this option is selected, UDFs will be allowed for use in Product Layouts. If this option is not selected, you will be unable to use UDFs. Require Order Origin. If this option is selected, you will be required to enter an order origin or you will not be allowed to save and close. If this option is not selected, you will be allowed to close without an order origin. Show Pricing Form at Full Screen. If this option is selected, the pricing form will be shown as full screen. If this option is not selected, the pricing form will be shown at the default size. Tax Class Blank by Default. If this option is selected, the tax class field will be left blank by default. If this option is not selected, the tax class will not be blank. Show Company Info. If this option is selected, the customer's company info will show on all orders, estimates, and service tickets. If this option is not selected, the info will not be displayed on these documents. Show Primary Contact Name when selecting a Company. If this option is selected, the primary contact name will show when selecting a company. If this option is not selected, the contact name will not appear. Show Walk-In Company checkbox. When this option is selected, the walk-in company checkbox will be shown on all orders and estimates. If this option is not selected, this box will not be shown. Default Customer to Walk-In. When this option is selected, all orders and estimates will by default be marked as walk-in customers. When this option is not selected, you will have to manually mark a customer as a walk-in customer. Close Transaction after Save. If this option is selected, a transaction will automatically close after being saved. If this option is not selected, a transaction will remain open after being saved. Replace HTMLLISTITEM with Crystal Supported bullet. Crystal does not support many HTML functions, including bulleted list. This option says if you see an HTML bulleted list in a product layout, then replace it with a bullet that Crystal does support. Show Advanced Item Controls. If this option is selected, the advanced item controls will appear. If this option is not selected, the controls will not show. Default Ship From Address to Store's Pick Up Address. If this option is selected, the ship from address will be the same as the store's pick up address by default. If this option is not selected, you will have to manually enter the store's ship from address. Allow Proof Date and default to: days from order create date.If this option is selected, the proof date will be shown and you can set it to be a certain number of days from the order create date. The number in the scroll box represents the number of days after the order create date that you want the proof date to be. If this option is not selected, the Proof date will not be shown. Show due date. When this option is selected, the due date will be shown on all orders, estimates, and service tickets. If this option is not selected, no due date will be shown. Due Date is Required. When this option is selected, a due date will be required to save and close your transaction. When this option is not selected, no due date will be required. Automatically calculate due date. If this option is selected, your due date will be automatically calculated for you. 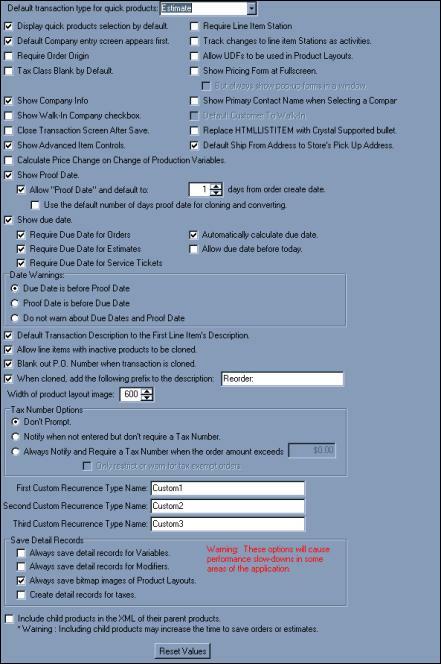 If this option is not selected, you will have to calculate the due date manually. Allow due date before today. If this option is selected, you will be allowed to set the due date before the current date. If this option is not selected, the due date must be a date on or after the current date. Due Date is before Proof Date. If this option is selected, you will be warned if the due date is before the proof date. If this option is not selected, you will not be warned. Proof Date is before Due Date. If this option is selected, you will be warned if the proof date is before the due date. If this option is not selected, you will not be warned. Do not warn about Due Dates and Proof Date. If this option is selected, you will not be warned about due dates or proof dates. Default Transaction Description to the First Line Item's Description. When this option is selected, the first line item's description will also appear as the default transaction description. If this option is not selected, the transaction description will not automatically be the same as the first line item's description. Blank out P.O. Number when transaction is cloned. When this option is selected, the P.O. Number (on the Totals tab) is cleared on the cloned transaction. Option available in versions 04.50.1103.1801 and later. When cloned, add the following prefix to the description: [ Re-Order ]. When this option is selected, a prefix of your choosing will be added to the description of the cloned transaction. If this option is not selected, no prefix will be added. Width of Product Layout Image: .When this option is selected, you can set the width of the product layout image. When this option is not selected, the product layout image will appear as the default width. Don't Prompt. When this option is selected, you will not be prompted for a tax number. Notify when not entered but don't require a Tax Number. When this option is selected, you will be notified if no tax number is entered, but you will not be required to enter one. Always Notify and Require a Tax Number when the order amount exceeds: [ $0.00 ]. When this option is selected, you will always be notified and required to enter a tax number if an order exceeds a value of your choosing. If this box is not selected, you will not be notified or required to enter a tax number. Only restrict or warn for tax exempt orders. When this option is selected, you will only be restricted or warned for tax exempt orders. If this option is not selected, you will not be warned or restricted. *Warning: These options will cause performance slow-downs in some areas of the application. Always Save Detail Records for Variables. If this option is selected, the detail records for variables will always be saved in a created variable records table. If this option is not selected, the variable records will be saved as XML documents. Always Save Detail Records for Modifiers. If this option is selected, the detail records for modifiers will always be saved in a created modifier records table. If this option is not selected, the modifier records will be saved as XML documents. Always Save Bitmap Images of Product Layouts. If this option is selected, the bitmap images of product layouts will always be saved in a created bitmap images table. If this option is not selected, the images will be saved as XML documents. Create Detail Records for Taxes. If this option is selected, detail records will be created for taxes. If this option is not selected, no detail records will be created. Include child products in the XML of their parent products. When this option is selected, the child products will be included in the XML of their parent products. If this option is not selected, the child products will not be included. *Warning: Including child products may increase the time to save orders or estimates. Show Production Station. If this option is selected, the production station will always show on the order. If this option is not selected, the station will not show. Require Production Station. If this option is selected, you will be required to enter a production station. If this option is not selected, you will not have to enter a production station on the order. Show Station on Sale. If this option is selected, the station on sale will always appear on the order. If this option is not selected, the station on sale will not show. Require Station On Sale. If this option is selected, you will be required to select a station on sale. If this option is not selected, no station on sale will be required on the order. Enable credit memos. When this option is selected, you will be able to create credit memos on individual orders. If this option is not selected, you will not be able to create a credit memo. Track changes to order stations as activities. If this option is selected, all changes to order stations will be tracked via activities. If this option is not selected, no activities will be created to track changes. Treat new Orders as WIP (not Sale). When this option is selected, all new orders will be treated as WIP instead of Sale. If this option is not selected, all new orders will be treated as Sale. Enable Built Status between WIP and Sales. 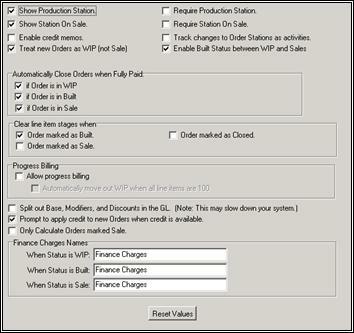 When this option is selected, you will be able to change the status to WIP, Sales, or Built. If this option is not selected, you will only be able to change the status from WIP to Sales. If Order is in WIP. If this option is selected and an order in WIP becomes fully paid, it will become a closed order. If Order is in Built. If this option is selected and an order in Built becomes fully paid, it will become a closed order. If Order is in Sale. If this option is selected and an order in Sale becomes fully paid, it will become a closed order. Order marked as Built. When this option is selected, all line item stages will be cleared when an item's status is changed to Built. If this option is not selected, the line item stages will remain the same. Order marked as Closed. When this option is selected, all line item stages will be cleared when an item's status is changed to Closed. If this option is not selected, the line item stages will remain the same. Order marked as Sale. When this option is selected, all line item stages will be cleared when an item's status is changed to sale. If this option is not selected, the line item stages will remain the same. Allow Progress Billing. If this option is selected, you will be allowed to use progress billing. If this option is not selected, progress billing will be unavailable. Automatically move out WIP when all line items are 100. When this option is selected, orders will be moved out of WIP when all line items are 100% completed. If this option is not selected, orders will stay in WIP until they are manually moved. Split out Base, Modifiers, and Discounts in the GL (Note: This may slow down your system.) When this option is selected, the price in the GL will be split among the Base price, Modifiers, and Discounts. If this option is not selected, there will only be one price in the GL. Prompt to apply credit to new orders when credit is available. If this option is selected, you will be prompted to apply credit to a new order if there is credit available. If this option is not selected, you will not be prompted. Only Calculate Orders marked Sale. If this option is selected, only orders marked Sale will have their prices calculated. If this option is not selected, all Orders will be calculated, regardless of their status. When Status is WIP: [ text in-put field ]. This text entry field allows you to give finance charges a certain name when the orders status is WIP. When Status is Built: [ text in-put field ]. This text entry field allows you to give finance charges a certain name when the orders status is Built. When Status is Sale: [ text in-put field ]. This text entry field allows you to give finance charges a certain name when the orders status is Sale. Make orders for converted estimates. If this option is selected, orders will be created when an estimate is converted. If this option is not selected, orders will not be created when an estimate is converted. Edit orders after converted by default. When this option is selected, the edit menu will automatically appear after an estimate is converted to an order. If this option is not selected, the menu will not appear by default. Make service tickets for converted Estimates. If this option is selected, service tickets will be created when an estimate is converted. If this option is not selected, no service tickets will be created. Edit service tickets after converted by default. When this option is selected, the edit menu will automatically appear after a service ticket is created. If this option is not selected, the menu will not appear by default. Use variations for Estimates. When this option is selected, you will be able to create different variations for an estimate. If this option is not selected, you will be unable to make any variations. Require Reason for Estimate Edit. If this option is selected, a reason will be required for all estimate edits. If this option is not selected, there will be no reason needed to make an edit. Show Estimate Station. If this option is selected, the estimate station will appear on all estimates. If this option is not selected, the station will not appear. Require Estimate Station. If this option is selected, an estimate station will be required on an estimate in order to save and exit. If this option is not selected, you will be able to save and close without an estimate station. Estimate Converted to an order. When this option is selected, the line item stages will be cleared when an estimate is converted to an order. If this option is not selected, the line item stages will stay as they are. Track Changes to Estimate Stations as activities. If this option is selected, all changes to estimate stations will be tracked as activities. If this option is not selected, no activities will be created to track changes. This screen can hold a list of possible reasons why an estimate was cancelled. This screen can hold a list of possible reasons why an estimate was rejected. Show description. When this option is selected, the description of the product will appear first on the transaction item list. When this option is not selected, the product name will appear instead. Show product name. When this option is selected, the product name will appear first on the transaction item list. When this option is not selected, the description of the product will appear instead. Show both. When this option is selected, both the description of the product and the product name will appear on the transaction item list. Include child prices when children are not showing. If this option is selected, the child prices will be included even if the children are not showing. If this option is not selected, the child prices will appear only if the children are showing. Station. If this option is selected, the station column will show on the transaction item list. Otherwise, it will not appear on the list. Base Price. If this option is selected, the base price column will show on the transaction item list. Otherwise, it will not appear on the list. Modifier Price. If this option is selected, the modifier price column will show on the transaction item list. Otherwise, it will not appear on the list. Rounding/Adjustments. If this option is selected, the rounding/adjustments column will show on the transaction item list. Otherwise, it will not appear on the list. Discount Amount. If this option is selected, the discount amount column will show on the transaction item list. Otherwise, it will not appear on the list. Unit Price. If this option is selected, the unit price column will show on the transaction item list. Otherwise, it will not appear on the list. Subtotal. 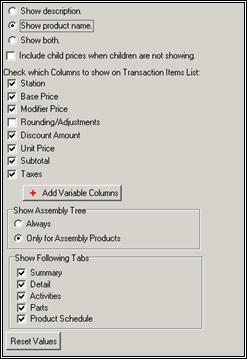 If this option is selected, the subtotal column will show on the transaction item list. Otherwise, it will not appear on the list. Taxes. If this option is selected, the taxes column will show on the transaction item list. Otherwise, it will not appear on the list. By clicking the 'Add Variable Choices' button, the entire list of line item variables appears. Each line item has a check box. As you check these boxes, the choice appears in the right column and becomes part of the default line item list. Always. 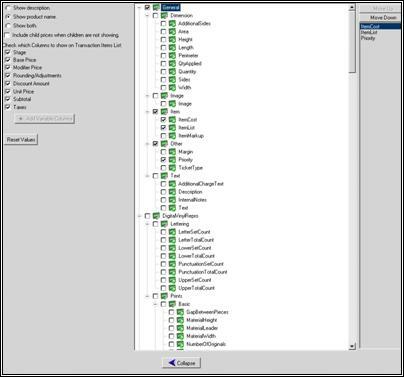 If this option is selected, the assembly tree will always show for all products, whether the product is an assembly product or not. Only for assembly products. If this option is selected, the assembly tree will only show for products that are assembly products. Summary. If this option is selected, the summary tab will appear. If this option is not selected, there will be no summary tab. Detail. If this option is selected, the detail tab will appear. If this option is not selected, there will be no detail tab. Activities. If this option is selected, the activities tab will appear. If this option is not selected, there will be no activities tab. Parts. If this option is selected, the parts tab will appear. If this option is not selected, there will be no parts tab. Product Schedule. If this option is selected, the product schedule tab will appear. If this option is not selected, there will be no product schedule tab. Enable Service Tickets. When this option is selected, you will be able to create service tickets. When this option is not selected, you will be unable to create service tickets. Default Service Ticket Type: Whichever service ticket type you choose will become your default service ticket type. Show Service Ticket Station. 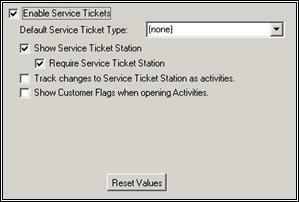 If this option is selected, the service ticket station will appear on the service ticket. If this option is not selected, the service ticket station will not appear. Require Service Ticket Station. When this option is selected, you be required to select a service ticket station. If this option is not selected, you will not be required to select a service ticket station. Track changes to Service Ticket Station as activities. If this option is selected, all changes to service ticket stations will be tracked as activities. If this option is not selected, no activities will be created to track changes. Show Customer Flags when opening Activities. If this option is selected, all customer flags will show when you open activities. If this option is not selected, no customer flags will be shown. Reset Values: If this button is clicked it will reset all your current selections to your default selections. I want all orders for this store to be validated with a minimum amount of: [ $0.00 ]. - If this option is selected, all orders with a minimum amount of the dollar amount selected will need to be validated. I want all the orders in this store to have a minimum deposit of [ $0.00 ]. - If this option is selected, all orders will have to have a minimum deposit of the dollar amount chosen. Next Order Number: [ # ]. This is where the order number for the next order will appear. You can also click the 'Set Next Order Number' button and set your own number for the next order. Next Estimate Number: [ # ]. This is where the estimate number for the next estimate will appear. You can also click the 'Set Next Estimate Number' button and set your own number for the next estimate. Next Recurring Order Number: [ # ]. This is where the recurring order number for the next recurring order will appear. You can also click the 'Set Next Recurring Order Number' button and set your own number for the next recurring order. Invoice Prefix: [ text entry ]. This is where you can enter a prefix of your choice to attach to all invoice numbers. If you leave it blank, no prefix will be added to invoice numbers. Set invoice number to the order number. 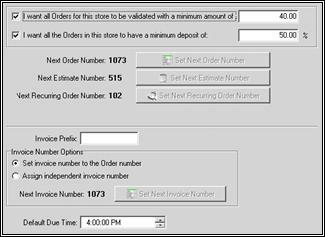 When this option is selected, the invoice number will be the same as the order number. Assign independent invoice number. When this option is selected, the invoice will have an independent number instead of the same number as the order. Next Invoice Number: [ # ]. This is where the number for the next invoice will appear. You can also click the 'Set Next Invoice Number' button and set your own number for the next invoice. Default Due Time: With this option, you can set a default due time. Base Price - If this option is selected, the total of line item prices will be rounded. Unit Price - If this option is selected, the unit price of line items will be rounded. Digits after the decimal to round to: .With this option, you can see the number of digits after the decimal that the rounded line item price will have. Priority Name: [ text entry ]. This box shows the name of the priority that you have highlighted on the left of the screen. Active. If this option is selected, it makes the current priority active. If it's not selected, the current priority will be considered inactive. Priority Level: .This scroll box allows you to set the priority level of the current priority; the higher the number, the higher the priority. Color: Use Default If this option is selected, it will use the default color for your current priority. If it is not selected, Windows color for text will be used. Font Color: .This option allows you to choose the font color for your explorer. Show Inactive. If this option is selected, all priorities will appear in the list, whether they are active or inactive. If this option is not selected, only the active priorities will be shown. - This option allows you to create templates for invoice and/or estimate notes. In this screenshot, the note template is named “Customer Estimate Pickup”, which is shown in the first text entry field. - This option allows you to create templates for internal production notes. In this screenshot, the note template is named “Call before Install”, which is shown in the first text entry field. Show Inactive. If this option is selected, all production note templates will appear in the list, whether they are active or inactive. If this option is not selected, only the active production note templates will be shown. - This option allows you to create templates for Estimate Greetings. In this screenshot, the Estimate Greetings template is named “Appreciation”, which is shown in the first text entry field. - Underneath the name of the template, you are able to create the template. This template reads “Dear . We appreciate the opportunity to provide this quotation to you. We hope this meets your approval and look forward to serving you in the future. Thanks, ”. We appreciate the opportunity to provide this quotation to you. We hope this meets your approval and look forward to serving you in the future.